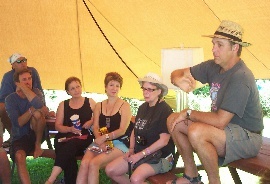 Mark presents a workshop on Green Building & Healthy Homes at the Lake Eden Arts Festival. 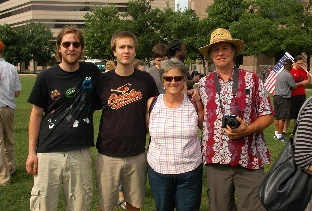 Right: Mark & his wife, Wanda Sundermann, & two of three sons. building foundations for multi-story buildings. siding work from general contractors. building and installing stair systems and handrails. - Worked for This End Up Furniture Co. in Raleigh, NC, building furniture for the first four years. - In 1985, I made a proposal to management that outlined my observations that a full-time wood savings program could save the company tens of thousands of dollars per year. My proposal was accepted and I was chosen to be the Material Savings Coordinator. I worked successfully with the carpenters, lumber salespeople, sawmill workers, and wood recycling contacts to significantly reduce the amount of wood wasted, as well as implementing programs to reduce the consumption of other materials such as sanding belts, glue, etc. - Began my own carpentry business. - Also self-published a monthly tabloid called "Energy Unlimited". This publication contained information for local activists, policy makers, construction professionals, and citizens on safe and efficient energy paths. - Founding member and editor of The Prism, a monthly tabloid devoted to local issues in the Chapel Hill area. - Selected by the Alternative Energy Corporation (a non-profit building science agency sponsored by the State of North Carolina and partially supported by the utility ratepayers of the state, now called Advanced Energy Corporation) to be a member of a "green building" training team of about a dozen industry professionals that would undergo training in current building science and then hold seminars around the state to spread the word. The team members were fortunate to receive the training, but funding issues prevented us from teaching seminars around the state. - I wrote a series of early green building articles in Remodeling News magazine. - I wrote a regular column for the Chapel Hill Herald. In 1997, after being dropped by the Chapel Hill Herald, I was immediately picked up by the rival paper, the Chapel Hill News. - Purchased seamless gutter machine and began providing gutter services to builders and homeowners. In the course of this work, we have had the opportunity to do a few rain-harvesting projects. - My company deconstructed a prominent downtown building built in 1936, prompting press coverage promoting the practice of deconstruction and providing lots of beautiful wood for my personal house that would be built two years later. - Elected to serve as a member of the Board of Directors of the North Carolina Solar Energy Association. - Appointed by the Orange County Commissioners to serve on the county's Economic Development Commission. - Appointed by the Orange County Board of Commissioners to serve on the Orange Water and Sewer Authority Board of Directors. From October 2003 until September 2005, I served as Chair of the Board. During my tenure, we dealt with the record drought of 2001-02, created new water conservation standards for the community, and partnered with UNC on a treated wastewater re-use system. I served until June of 2006. - Completed Marcoplos-Sundermann eco-home (personal house), a model green building incorporating passive and active solar components, passive cooling, recycled materials, etc. Received local press attention after week-long power outage during the 2003 ice storm when it was one of just a handful of homes with on-site power generation that was relatively unaffected by the disaster. 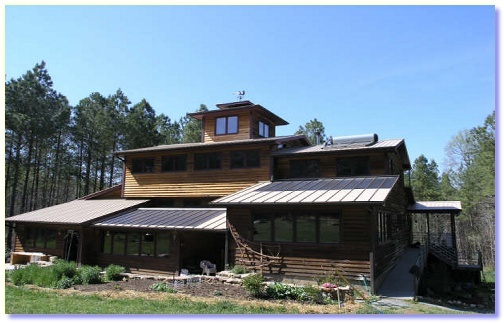 See the North Carolina Green Building Design Database. - Taught a class in Green Building at Central Carolina Community College in Pittsboro, NC. - Hired as "Green Building Consultant" for the Winmore development in Carrboro, NC, developing green building guidelines for the project. - Articles and photographs published in Smart Homeowner magazine on passive cooling techniques and home energy-efficiency. - Subsequently selected to write a regular column entitled "Building Basics". - Appointed by the Orange County Commissioners to serve on the Orange County Planning Board. - Marcoplos Construction was voted a finalist in Green Building in the Indy "Best of the Triangle" issue. Senior independent study project - short story writing. 1971 semester - All Atlantic Coast Conference soccer player as a freshman. University of New Hampshire - finished freshman year (1972). - After extensive traveling in Mexico and the western U.S., I moved to Chapel Hill, NC and worked on a framing crew, stick-framing apartment buildings. "I thoroughly enjoyed your Green Building talk at the LEAF Fest on Saturday. You said so much in such common-sense terms. I'm confident that you inspired a lot of people in that quick hour."